For almost 4 decades now, Lilawati Vidya Mandir stands as a custodian of holistic education. A plethora of co – curricular and sports activities, seminars & workshops, yoga and meditation form an integral part of curriculum. Also under the name Bal Sabha, several Inter- class and Inter -section competitions are organised. The activities of the school viz., cultural, spiritual, academic as well as sports and games are directed towards nurturing the cognitive, social, physical, spiritual and emotional domain of each student. School’s staff have been consistently striving to inculcate the spirit of sportsmanship among students. The special grooming has made Lilawatiites tech savvy and well-informed, thus helping them win various Inter- School Literary and Sports events. The school management takes keen interest in updating the infrastructural facilities. Chairman Sh. Raj Kumar Gupta and Vice Chairperson Smt. Geeta Gupta ensure regular renovations and constructions that suit the needs of modern day education. Representing the younger and vibrant generation, Manager Harsha Gupta and Jt. Secretary Yash Gupta recently pushed twin projects for introduction of Educomp Smart Classes and a Language Lab. Proudly this is in addition to the already existing T.T room, instrumental music room, two music riyaz rooms, judo room, dance room and seminar hall. For sports, a large playground also has facilities for cricket, football, basketball, athletics and skating. L.V.M endeavours to sensitise children to the needs of society and ecology. Hence, students work under Special Adult Literacy Drive (SALD) and also an Eco-club. Trips and Excursions are meticulously planned to make them age and subject appropriate. The school owes its success to a team work of management and staff that work together to continually assess needs, set goals and implement changes. At the helm of affairs is school Principal Smt. Sushma Khurana who has been a fiery inspiration and a constant guidance to the staff and school children . “Strive today and thrive tomorrow” , keeping this maxim in view students are trained to handle curricular and co – curricular activities simultaneously. They are instilled with a spirit of self – discipline, social awareness and a pride in their rich cultural heritage. L.V.M with its consistent efforts in the field of education and all round development of students has reached its zenith. Presenting a fusion of traditional values and modern thought in the realm of education, it continues to be different from other schools with almost 3000 students on its roll. 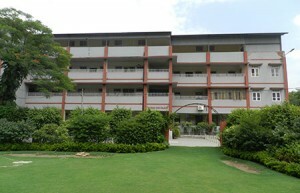 Today it ranks among the prestigious public schools of Delhi.